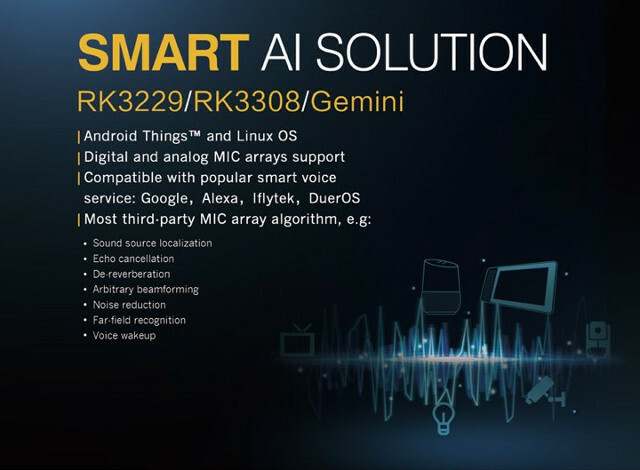 Rockchip has posted a tweet about smart speakers, specifically about Midea AI speaker based on Rockchip RK3229, but the second image is what caught my eyes, as it reveals two new Arm Cortex A35 processor designed for “Smart AI solutions”, namely RK3308 and “Gemini” Processor. Rockchip will provide support for Android Thing and Linux for the processors, as well as integration with MIC arrays boards and popular voice services such as Amazon Alexa, Google Assistant, Baidu DuerOS, and others. Arm Cortex A35 64-bit processor was unveiled in 2015 as a replacement for Cortex A7 with slightly lower power consumption, and better performance, but so far we have not seen it in many SoCs, especially standalone, one exception being NXP i.MX 8X. None of the new processors have a product page for now, so details are limited, but it appears RK3308 looks better suited for “headless” speakers, while Gemini processor may be targeting smart displays instead. It’s also the second time we can read about the mysterious Mali Dvalin GPU, as we first found it in the upcoming Amlogic S905X2 processor.